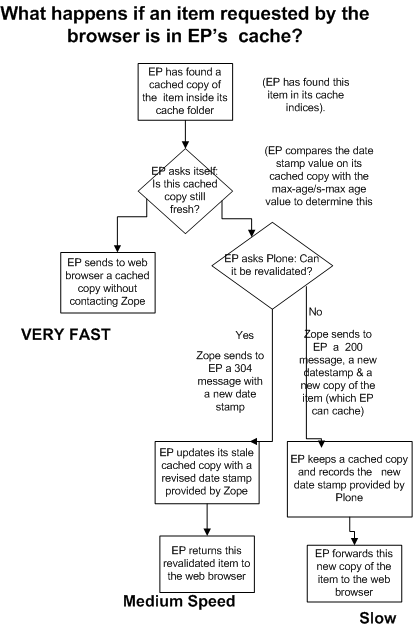 Configure a cache profile in Plone. You do this after you install and enable the plone.app.caching add-on. (For earlier versions of Plone, another product CacheFu was also used). One prerequisite to caching is knowing how much caching is too much and having a way to apply different caching policies to different kinds of Plone content. The Plone.app.caching add-on provides sensible defaults for common content types. For more information about plone.app.caching go to http://plone.org/products/plone.app.caching/. After plone.app.caching is installed, you can tweak your settings in the Plone Site Setup --> Caching menu. After you enable caching and import a caching profile, you can also customize the settings even further by selecting the appropriate ruleset to use. To do this, go to Caching Operations and choose the Operation dropdown appropriate for the content type. Increasing the time that a content item is fresh will allow Enfold Proxy to handle the request by itself without having to bother Plone. You do this in Plone by going to your caching product and increasing the max-age or s-max-age value for a content item or a category of content items. If you have enabled Headers or Debug log level, you can view the S-max-age or max-age value as well. When an item is received from the backend server, it is examined to see if it is "cacheable" - that is, if it is able to be stored in the cache and used to satisfy future requests for that item. 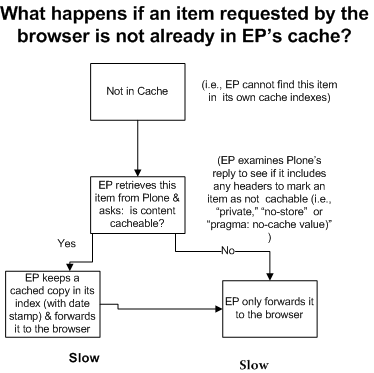 Unless Plone includes a special header which specifies that the item is not cacheable, Enfold Proxy will keep a copy locally on its machine which it can use for responding to future browser requests. Note: Browser-based tools for viewing HTTP headers don't show the full story. That is because you won't see the HTTP headers which Enfold Proxy and Plone will exchange. The easiest way to view the HTTP headers which EP is sending and receiving (from both the browser and Plone) is to examine the Enfold Proxy logs. Enfold Proxy has a log level called Headers Log Level to permit more user-friendly viewing of the HTTP traffic. But first you will need to enable this log level in your proxy definition. The last modified date for the requested object, in RFC 2822 format. This header is used to validate an item with the backend server after it is stale.